V.E. title: "Monday Talk with Daniel Pipes on the New Middle East, Europe and the US"
Vocal Europe: How do the Obama and Trump administrations differ in their policies toward the Middle East? Daniel Pipes: The Obama Middle East policy is easy to describe, as it was quite consistent over eight long years: Apologize for past American transgressions, "lead from behind," reach out to enemies, and denigrate allies. In contrast, seven months of Trump leave a picture of near-complete confusion. 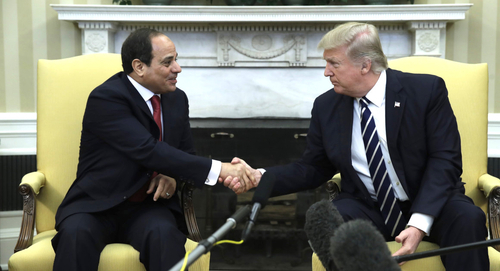 Perhaps the best example is Trump in April praising Egyptian president Sisi for doing "a fantastic job," followed in August by a substantial cut in U.S. aid – and which the Egyptians only learned about by reading a Reuters dispatch! While the contradiction can be explained, it confirms the chaos. Other examples of ambiguity: whether to move the U.S. embassy in Israel to Jerusalem, whether to rip up the Iran deal, whether to stand with the Saudis et al. against Qatar, and whether to fight Hizbullah or provide it with free weapons. Obviously, this record does not encourage confident predictions. VE: In October, Trump will have to take one of his most important decisions: whether to continue certifying Iranian compliance with the Joint Comprehensive Plan of Action (JCPOA) nuclear deal reached in 2015. He opposes it but Secretary of State Rex Tillerson believes the U.S. should stay in the deal and hold Tehran accountable, including its acting as "a good neighbor." Given Iran's support for foreign fighters in Syria and Iraq, its support for proxies, including arm shipments, which option would best induce Iran to act as a "good neighbor" - re-certification, declaring Iran non-compliant, or something else? DP: I favor tearing up the JCPOA. (By the way, what exactly is a "plan of action"?) As Trump said, it is "the worst deal ever negotiated." Or, as I say, it is the worst foreign deal in American history. But, as with Obamacare, it's easier to rail against the prior president's two major accomplishments than to undo them. VE: Do you expect that Washington will take tougher actions against Iran? DP: Lacking a philosophical basis for his views and actions, Trump responds to immediate stimuli, making him notoriously difficult to predict. If the Iranians appease him, no. If they anger him, yes. Incidentally, I find it curious that several Middle East actors in addition to Tehran (ISIS, the Palestinian Authority) ignore this basic insight about Trump and openly defy him, at their risk. In contrast, Saudi Arabia's Mohammad bin Salman and Israel's Binyamin Netanyahu have him figured out. VE: How do you assess U.S. policy toward the Qatar crisis? DP: The president went off on his own tangent (full-throated support for Riyadh) while the foreign policy establishment pulled another way (low-profile mediation). It appears the establishment view has prevailed. VE: What do you make of the current visit to the Middle East by a White House delegation led by presidential adviser Jared Kushner? DP: It's a ritualistic act of diplomacy that will be quickly forgotten. VE: Is there a possible solution to the Israeli-Palestinian conflict? DP: Yes, but only when Palestinians recognize that the Jewish state is permanent and stop trying to harm it. When this happens, both parties will gain. Israelis won't get murdered at pizzerias; Palestinians can begin to build their polity, economy, society, and culture. 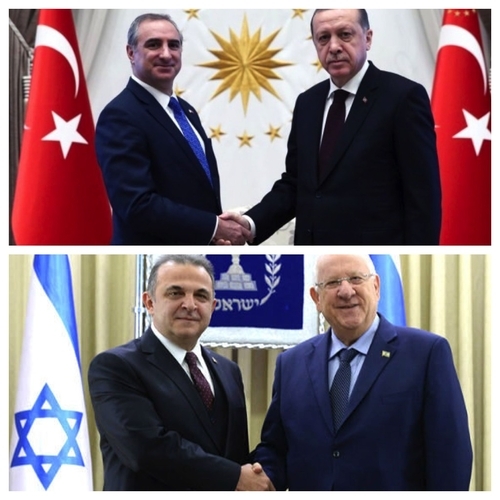 VE: Israel and Turkey exchanged ambassadors in late 2016 after a six-year rupture. What are the challenges to the full normalization of Turkey-Israel relations? DP: Full normalization is impossible so long as Turkey's government uses Israel as an instrument to whip up Islamist antisemitism. Turkey's President Erdoğan (top right) and Israel's President Rivlin (bottom right) with, respectively, the new Israeli and Turkish ambassadors In December 2016. Which national pair looks happier? VE: The Kurdistan Regional Government (KRG) will hold a referendum on independence on Sep. 25, 2017. Why does the Trump administration ask the KRG to postpone the vote until at least after the Iraqi national elections in April 2018? DP: The State Department stated in June its concern that the referendum will distract from "more urgent priorities" such as the defeat of ISIS. To me, that's not a reason (I don't even want ISIS to disappear because, horrid as it is, it holds off Iranian expansion, which is yet more threatening). Although I support Kurdish independence and a single, grand Kurdish state, I see the referendum as a danger to all concerned by further unsettling a highly unstable region, perhaps provoking any of Turkish, Iranian, or Iraqi central government invasions of the KRG, perhaps leading to a confrontation between U.S. and Russian forces. VE: Ankara wants the KRG to cancel the referendum. If the KRG refuses, how will the referendum affect Turkish-KRG relations? DP: It could lead the Republic of Turkey to diminish economic ties and might even lead to a Turkish invasion. VE: How will it affect Turkey's relations with the Kurds of Turkey and Syria? DP: I expect Ankara to crack down even harder on its Kurdish citizens and to become more aggressive towards the Kurds of Syria. VE: During a rare visit to NATO-member Turkey by Iran's military chief of staff two weeks ago, Turkish and Iranian military leaders discussed counterterrorism and cooperation in Syria; does this signal a strategic rapprochement between the two governments? DP: I doubt it. As I just wrote in a historical review of the two countries' relations, "the Idlib accord looks flimsy and transient. Tehran and Ankara will probably soon turn against each other and with renewed vigor continue their perpetual rivalry." VE: Will their improved relations trigger a further deterioration in U.S.-Turkish ties? DP: For sure. A NATO member purchasing a major defense system from Russia, jointly exercising with China, and coordinating with Iran? To Americans, Turkey looks a lot more like adversary than ally. VE: What do you make of Turkey's demands for extradition of Fethullah Gülen from the United States for his alleged role in the July 2016 coup attempt? 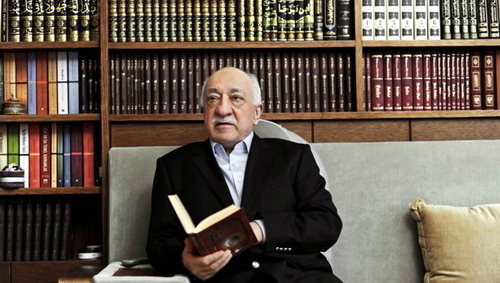 Fethullah Gülen, at home in Pennsylvania. DP: The Turkish opposition calls it the "controlled" coup d'état in the sense that it "was foreseen, not prevented and benefited from" by Erdoğan and the ruling AK party; I agree with this description, in part because the Turkish government has systematically resisted an independent inquiry into the coup. Turning to Gülen: U.S. government sources have indicated that Ankara has not produced evidence of his complicity in, much less his leadership of, the coup attempt. Accordingly, I dismiss this accusation as the usual Erdoğan puffery and deceit.